Last March 17, rather than spending St. Patrick's Day drinking green beer like other students, the students of Nunavut Sivuniksavut held a demonstration on Parliament Hill to show support for Inuit right to hunt seal. The students wanted to raise awareness about the importance of the seal hunt to Indigenous communities. Even many animal rights activists who argue for a ban on the seal hunt often indicate that they are willing to make an exception for Indigenous subsistence hunting and mainly want to focus on commercial seal hunters. However, it's important to know that the majority of the commercial seal hunt is actually done by Inuit hunters, whose main source of income is the commercial seal hunt, including income to buy the gas, ammunition and other hunting equipment to get the seal meat to feed their families. It's not so easy to separate the two notions, and the seal hunt bans have had a huge devastating effect on the local economies of Inuit communities, even with a supposed Indigenous exception. 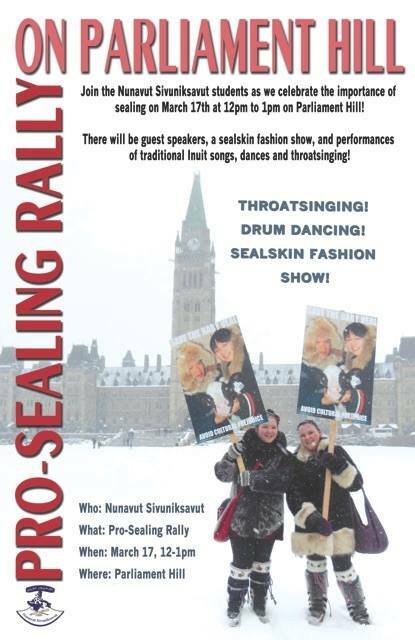 The rally involved demonstrations of traditional Inuit throat singing, dancing, and even a sealskin fashion show. I'm always impressed by Nunavut Sivuniksavut students' strong political engagement and eagerness to share their cultural pride with the rest of the world. Checked out the counter protest to the Concerned Coalition of Concerned Citizens' March for Freedom, Liberty & Justice that was supposedly planned today. Saw only one guy turn up for the original March; the rest of the crowd seemed to be rallying against Islamophobia.